Diana Babish poses with a puppy outside her animal shelter in Beit Sahour, West Bank. God gives everyone a mission, Diana George Babish said as she fielded a phone call about a dog who had been shot in Hebron. The mission God gave her is to take care of the abused and abandoned animals in the West Bank and the Gaza Strip, she said. Last year Babish, who is in her late 40s, quit her day job as a bank manager to dedicate herself full time to running the first animal shelter in the West Bank, the Animal and Environment Association—Bethlehem Palestine, which she established in 2013. Church youth groups provide an escape from life’s pressures and help in forming strong friendships, young Lebanese Catholics said at the annual meeting of their Marian group. Under the theme, “Mary is Our Captain,” some 500 members of the Fraternities of the Youth of Virgin Mary met on 30 September at St. Joseph School in Cornet Chahwan, north of Beirut. “You were chosen by God to be a light. You can be a witness to others who don’t know Jesus,” Bishop Aoun said, noting the 3-28 October Synod of Bishops to discuss “young people, the faith and vocational discernment” at the Vatican. “With all the chaos and stress we face, it’s easy to ‘lose’ God. But I know that on the day we have our weekly meeting ... I can be refreshed in my faith,” said Zaghrini, who works in information technology. “Every young man and woman has to know that their church has a past, and the older generation should feel assured that the church has a future -- we are the future of the church,” Allam said. Concelebrating the Mass with Bishop Aoun was the Rev. Marcellino Assaf, who was ordained in September and heard his calling to the priesthood as a member of the Fraternities of the Youth of Virgin Mary. Especially with the synod happening in the same month, it is good to see Lebanese youth “gathering with such joy and enthusiasm,” Msgr. Ivan Santos, charge d’affaires of the Vatican Embassy in Lebanon, told Catholic News Service. “They are the hope of Lebanon,” he said. Msgr. Santos urged the young people to follow Pope Francis’ call to pray the rosary each day in October. “Young people, you are the answer for the church and for your country,” he said. In this image from 2017, a Russian Orthodox woman lights a candle and prays in an Orthodox parish in St. Petersburg. Russian Catholics hope ties won't be affected by inter-Orthodox tensions. Ultra-Orthodox Jews celebrate Simchat Torah holiday in Jerusalem (Channel NewsAsia) Orthodox Jewish men on Monday danced with scrolls of the Torah, celebrating the religious holiday of Simchat Torah (Rejoicing in the Torah) in one of Jerusalem’s oldest neighborhoods…? In an address to the participants of the Seminar on Ethics in Health, Pope Francis stressed the importance of forming a bond of humanity between health care workers and their patients. The conference, from 1-5 October, is sponsored by the Pontifical Academy for Life and led by Auxiliary Bishop Alberto Bochatey of La Plata, Argentina, and the Health Consensus Foundation, an Argentina-based organization comprised of local and international health care providers, according to the conference website. Pope Francis based his speech around 3 key words: miracle, care and trust. These three words are very valuable in a world in which health in general “and particularly in Latin America, is living through an era marked by the economic crisis”, said the Pope. With regards to the first word, “miracle,” the Pope said, “Those responsible for the institutions will tell me, and rightfully so, that we cannot perform miracles.” But, he explained, a miracle is not doing the impossible. A miracle is looking at an ill, helpless person and seeing a brother. The final word is “trust.” Pope Francis’ first example is “the trust the ill person has in themselves, that they will get better.” Of no less importance is the worker, who must be able to work in a serene atmosphere, in trusted surroundings. ”Placing yourself in the hands of someone else, especially when your life is at risk, is very difficult” said Pope Francis. “We must fight to keep this deeply human bond whole” said Pope Francis. “No aid institution alone can take the place of a human heart, nor that of human compassion,” he said, quoting Pope Saint John Paul II. 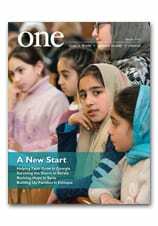 Read more about Springs of Hope in Lebanon in the January 2012 edition of ONE. CNEWA works in places with many different cultures, faiths and traditions — and during this time of year, we are reminded in a particular way of the rich religious and cultural traditions of the Jewish people. Sukkot is one of the three great pilgrim festivals in the Old Testament: Passover, the Feast of Weeks or Pentecost and Sukkot. Long before the construction of the Temple in Jerusalem, Sukkot was an agricultural festival celebrating the end of the harvest. This is clear in Exodus 34:22 where it is called the Feast of the Ingathering (ha’asîf) at the end of the year and is paired with the Feast of Weeks, which is earlier in the year at the wheat harvest. Sukkot runs for seven or eight days depending on whether one is in Israel or in the diaspora. The festival is outlined in detail in Leviticus 23:33-36, 39-43. It is to last seven days and the first and eighth (!) days are to be a “sacred assembly” on which no work is to be performed. It is a feast of celebration: “On the first day you shall take choice fruits, palm branches, boughs of leafy trees…and you shall rejoice in the presence of the Lord.” It is required that the people live in sukkot, “huts, shelters, booths,” made from branches of palm trees and other leafy trees. This is perhaps the most obvious practice that a non-Jew would notice. Jews throughout the world will build sukkot for the week. In major cities such as New York, it is not uncommon to see sukkot popping up on balconies of high rise apartments. For seven days, Jews will take their meals in the booths and some will even sleep in them. According to Leviticus, the booths are to remind the Israelites that their ancestors lived in shelters such as these during the Exodus. During one of the central days of Sukkot, there is the ceremony of drawing water, reminiscent of the purification ceremonies at the Temple. This ceremony is specifically mentioned in the seventh chapter of John’s Gospel and may have provided the occasion for Jesus’ exclamation: “If anyone is thirsty, let them come to me! Let the one come and drink, who believes in me” because he is “living water” (John 7:37-38). Also during Sukkot, Jews will display the etrog and the lulav. The etrog is a large citrus like a lemon but considerably larger, while the lulav is palm fronds which are often artfully woven in ways familiar to what some Christian cultures do with palms on Palm Sunday. Perhaps most significantly, though, the ending of Sukkot signals, in fact, a beginning — the start for Jews of a new year, full of promise and possibility.